It was a very exciting morning for 15 little girls dressed in pretty pink frocks. They danced to Julie Andrew’s version of “I Feel Pretty” from West Side Story and were not the least perturbed by towers of blazing flood lights and roving cameras. Before the end of the show at 1 pm, Aurora Dance and Performing Arts faculty member Aaron Khaled sang his version of Broadway’s Footloose. 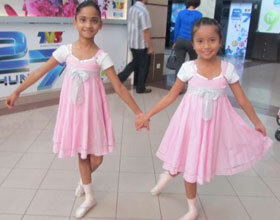 Aurora junior students perform Live at Sri Pentas on TV3's Wanita Hari Ini. Primary Students dance "Ahoy Popeye!!" Interview with Leong jin Li - senior teacher. 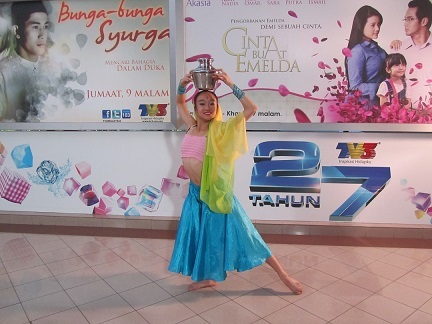 She spoke on the opening of ADPAC Aurora Dabce & Performing Arts Centre at kota Damansara in January. It offers music / drama / vocal as well as dance traiing . She also talked about Aurora's Musical theatre programme - new course for talented dancers who also love singing and acting.